James "William" Minerd was born on July 30, 1880 at Lemont Furnace, Fayette County, PA, the son of William and Sarah Elizabeth (Whoolery) Minerd. A longtime coal miner and steelworker, his life was filled with a series of great heartache -- losing a young wife, five children and an adult grandson in unusual, tragic ways. He was considered tall and stout, with brown eyes and brown hair. On Nov. 4, 1899, at the age of 19, William married 16-year-old Lizzie Bennington (1883-1899). She was the daughter of Chauncey and Mollie Bennington of Hopwood, Fayette County. But after just six weeks of marriage, and shortly after giving birth to a daughter Bessie, tragedy struck the young family. Lizzie died on Dec. 13, 1899 in the wee hours of a Sunday morning. Devastated over the loss of his wife, the grief-stricken William returned to his parents' home and worked as a coal miner at Brownfield. The tragedy compounded when their baby daughter Bessie became sick and died at the tender age of eight months at Brownfield, of "c. infantum." After five years as a childless widower, the 23-year-old William married 20-year-old Lillie Fordyce (1883-1968) on Aug. 3, 1903. She was a native of Markleysburg, Fayette County, and the daughter of David and Abbie Fordyce. 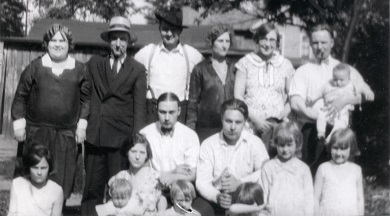 The Minerds went on to produce nine children -- John "Jack" Minerd, Clara Atkinson, Irene Rosenthal, Walter Minerd, Edith Minerd, Elsie Gnat, Dorothy Black, Lawrence Minerd, Arthur Minerd and Virginia Minerd. 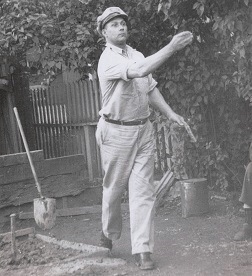 Click for additional photos of William's coal mining activities. Sadness enveloped the family in the late spring of 1911 when they were living in Smithfield. On June 3, 1911, son Walter, a tender 10 days old, died after he had been born prematurely and could not take nourishment. The son's remains were laid to rest at Hopwood Cemetery. Then, almsot two years later, daughter Edith died in Smithfield on April 14, 1913, just six days after her first birthday, having been stricken with pneumonia and whooping cough. Adding to the heartbreak, daughter Virginia died at birth three days before Christmas 1918, and was buried at Hopwood. All of the children's funerals were handled by the Vance Funeral Home of Smithfield. A single grave marker was erected at the grave, containing names and dates etched in granite. William registered for the World War I military draft after the United States entered World War I. In filling out his paperwork, in September 1918, he stated his occupation as coal miner for Scott and Brownfield at Smithfield, and that Lillie was his nearest living relative. The Minerds lived at Smithfield until about 1927. That year, following the death of William's mother, they made the decision to relocate to the city of Warren, Trumbull County, OH, where industrial jobs were much more plentiful, and where they remained for the rest of their lives. They made their home at 616 High Street in Warren. The great danger to children riding bicycles on public highways was brought very forcibly to the attention of officers of Warren … when Arthur Minerd … was almost instantly killed…. The bicycle on which the boy was riding was struck by a car…. The boy was one of three in a group riding bicycles, and dashed across the highway in front of the car when summoned by one of his companions. He was tossed against the curb, striking his head on the edge of the stone, fracturing his skull…. He was a student in the East Market St. school and was well liked by his teachers and classmates. Arthur's broken remains were transported back to Uniontown for interment in the family plot at Hopwood. Despite the many family heartaches, William continued his longtime work as a laborer for Republic Steel Corporation in Youngstown. When the United States Census was taken in 1930, he was a chipper at the mill, and they continued to resided on High Street. Their married son John, his wife Margaret and their two young children lived under their roof that year. The 1940 census also shows him as a laborer in the mill. Lillie also generated income for the family in 1940 as a cook in a grocery store. William finally retired in 1953, at the age of 73. Ten years after William retired, in 1963, the Minerds celebrated their 60th wedding anniversary. To celebrate, an open house was held at the home of their daughter, Dorothy Black. William and Lillie lived their remaining years on Henn Hyde Road in Warren. William passed away at the age of 86 at the Milton Manor Nursing Home on March 30, 1966. Lillie outlived him by a little more than two years. She died on July 16, 1968, at the age of 85. Her remains were brought back to Uniontown for interment. They are buried together for eternity in Hopwood , in the same plot as their fallen children and grandson, and in the same cemetery as parents, grandparents and great-grandparents. Son John Minerd (1904-1972) was born on Oct. 29, 1904 in Smithfield. He was married at least three known times. John's first spouse was Margaret Smith (1906- ? ) 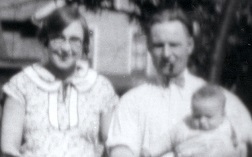 They were wed in about 1925, when John was age 20 and Margaret age 18. They resided circa 1925 in Fayette County but within a year or two migrated to Trumbull County, OH, settling in Warren, where John had obtained employment as an inspector in a steel mill. circa 1930, when the federal census enumeration was made, John and Margaret lived under his parents' roof. Their children were James William Minerd, Roy Edward Minerd, Kenneth Emery Minerd and Katherine "Kitty" Bassin. John and Margaret divorced in Trumbull County. Sometime during the 1930s, he married Mary Mason (1912- ? ). He was seven years older than she. In 1940, the Minerds dwelled next door to John's parents in Warren, where John was a truck driver for Burbank Van & Storage. After John's marriage to Mary ended, he made his home with his parents at 734 East Market Street, and worked as a warehouseman. At the age of 42, on July 17, 1948, he was united in wedlock for a third time, to 31-year-old Stella Kazenski (1917-1996). Rev. Harold Mohn officiated. Stella was the daughter of Stanley and Anna (Zawistowski) Kazenski of Youngstown, and moved as a girl to Cortland, OH. She "worked for 36 years in production at the General Electric Ohio Lamp Division, retiring in 1978," said a newspaper. She was a member of St. Robert Church and Ladies Guild. In 1952, the Minerds relocated from Warren to Johnston, near Cortland, OH. After 30 years of work for the moving company, John retired in 1963. He enjoyed hunting and the out-of-doors. John died in 1972, at the age of 67, from "a sudden illness," said the Niles Times. Dr. Robert Hibbard officiated at the funeral and burial in All Souls Cemetery. Stella survived her husband by 24 years and lived at 5705 ridge Road NE. She was admitted to St. Joseph Health Center and passed away in December 1996 of congestive heart failure. Son Roy Edward Minerd (1925-2001) was born on July 5, 1925 in Smithfield, Fayette County, PA. He came to Ohio as a young boy and grew up in Warren, Trumbull County, OH. At the age of 23, on Oct. 23, 1948, the 23-year-old Roy was united in wedlock with 24-year-old co-worker Josephine Frances Malvasi (1924-2015), of Niles, OH and the daughter of Philip and Margaret (Jacola) Malvasi. At the time of marriage, Roy earned a living by working at Packard Electric Company in Warren. They produced two daughters -- Phyllis Rae Kirchner and Margaret Ann Orslene. Roy served as a corporal in the U.S. Marine Corps during World War II and "retired in 1984 from the U.S. Postal Service, Niles office, after working 30 years," said a newspaper. Josephine "was employed by Packard Electric and The Living Room Restaurant until her retirement," reported the Warren Tribune-Chronicle. She "was an active member of St. Stephen Church and the Niles Catholic Womens Club. She enjoyed watching the Cleveland Indians and Browns." He died on Nov. 27, 2001, and was buried at Niles City Cemetery in Niles. Josephine survived by another 14 years. She passed away at home at the age of 91 on Sept. 11, 2015. A mass of Christian burial was held in St. Stephen Church, with Rev. James Korda officiating. In rest, she joined her husband at Niles City Cemetery. Granddaughter Phyllis Rae Minerd (1956- ? ) was born in 1956. She worked as an X-ray technician. When both were age 22, Phyllis married David A. Kirchner (1956- ? ), son of Donald and Mildred (Voytek) Kirchner. Rev. Thomas G. Ziegler oversaw the wedding ceremony on June 24, 1978. They lived in Palm Bay, FL. Granddaughter Margaret Ann Minerd was wedded to Michael Orslene and made their home in Cranberry, PA and Powell, OH. Daughter Katherine "Kitty" Minerd (1928-1979) was born on June 5, 1928 in Warren. She wed Forrest "Bud" Bassin (1926-1981). They had six known children -- Charles Bassin, John William "J.B." Bassin (nicknamed "Worm"), Patricia Sible, James Bassin, Richard Lee Bassin and Elsie Dvorchak. They resided in Waltersburg near Uniontown, Fayette County. At the age of 26, Forrest was badly burned in a freak accident in June 1952. Reported the Uniontown Evening Standard, he "was rushed to Uniontown hospital last night with second degree burns of the lower legs and right hand after a carburetor exploded in his car. Bassin reportedly was working on his car when the explosion occurred and his clothing caught fire from the gasoline flames. His wife heard his screams and called for help." Sadly, Kitty died in or around Uniontown in October 1979 at the age of 51. Her remains were placed into eternal repose in Sylvan Heights Cemetery. Now widowed, Forest apparently relocated to Texas. He passed away in Dickinson, Galveston County, TX in June 1981. Grandson John William "J.B." Bassin (nicknamed "Worm") (1954-2012) was born on June 13, 1954. He married Margaret McQuade in about 1991 and had three daughters -- Toni Eddings, Tana Hice and Missy Hair. With an associate degree in business from West Virginia University and an associate degree in accounting from Penn State University, J.B. built a career of three decades in restaurant management. He also was a veteran of the United States Marine Corps. They resided in Waltersburg, near Uniontown. J.B. passed away at the age of 57 on Jan. 6, 2012, with interment in Sylvan Heights Cemetery. Grandson Richard Lee Bassin ( ? - ? ) was born in (?). Upon graduation from Uniontown Area Senior High School in 1965, he spent four years with the U.S. Marine Corps, including a tour of duty of 19 months in Vietnam, followed by a posting at Camp LeJeune, NC. In June 1969, he was wedded to Eileen Virginia Mitchell ( ? - ? ), daughter of Louis P. Mitchell of Uniontown. The ceremony took place in Jacksonville, NC. In announcing the wedding, Eileen was pictured in the Uniontown Evening Standard. The couple established their new home in Ohio. Grandson James Bassin ( ? - ? ) married Diane ( ? - ? ). Granddaughter Patricia Bassin ( ? - ? ) was united in wedlock with Sible ( ? - ? )..
Granddaughter Elsie Bassin ( ? - ? ) was wedded to Dvorchak ( ? - ? ). In 2004, she is believed to have served as Fayette County Deputy Coroner and in 2012 served as chief administrative assistant for Fayette County Coroner Phillip Reilly. Son James William Minerd (1931 -1950) was born in about 1931 in Warren. He served as a private in the U.S. Army. He was assigned to Company B of the 34th Infantry Regiment, part of the 24th Infantry Division. When the Korean War broke out, in late June 1950, James' unit, was shipped out to South Korea. Tragically, less than a month later, on July 20, 1950, James was killed in action, during the fallback to the Pusan perimeter. A history of the fighting said that at Taejon, the North Korean Peoples Army "encircled, overran, and utterly shattered the American infantry...." Listed first in the local newspaper as missing, James finally was reported as killed in action. The 19-year-old soldier's remains were sent home for burial in the Minerd plot at Hopwood. An article in the Warren newspaper said he was the "first Trumbull County soldier to be reported missing in action in the fighting in Korea." Posthumously, he was awarded a Purple Heart. In 2003, a Korean War Memorial, dedicated to 119 casualties from Trumbull, Mahoning and Columbiana Counties, was dedicated in their memory. The name of James W. Minerd is among those engraved on the impressive structure. The memorial is located in Veterans Park in Wickliffe Circle in Austintown, on the west side of Youngstown, OH, and was funded by donations, selling bricks and fundraising by the Korean War Veterans Association, Chapter 137. Son Kenneth Emery Minerd (1934-1993) was born on Oct. 4, 1934 in Warren. He married Regina S. (Davis) Berry ( ? -living), daughter of Arthur D. and Patricia "Pat" (Gillis) Davis. Regina had been married before to Andrew Berry and brought three children to the marriage, among them Brian E. Berry and Beth Berry. The Minerds went on to produce their own family of children, among them Michael A. Minerd Sr., James Minerd, John Minerd and Patricia "Patty" Minerd. Kenneth left the marriage and made his home in Girard, Trumbull County, with the couple divorcing in June 1974 in Columbiana County, OH. Regina and Roy T. Altenburg, a truck driver from East Palestine, married in 1976. Several other offspring were involved and need to be sorted as to who's who -- Theresa Trosky and Susie Timmons. Kenneth passed away in Massillon, OH at the age of 58 on Aug. 20, 1993. His remains were lowered into repose in East Carmel Cemetery in Middleton, Columbiana County. Regina resided in Columbiana in 2015. Grandson Michael A. Minerd Sr. (1964-2000) was born the day after Christmas 1964 in Salem, Columbiana County, OH. As an adult, he made his home in East Palestine, Columbiana County and enjoyed motorcycling. Michael and Michelle Bryant are thought to have had two known children, Michael A. Minerd Jr. and Regina Minerd. He passed away on June 10, 2000 at the age of 35. Interment was in Saint Mary's Cemetery in East Palestine. An obituary was printed in the Salem News. Their son Michael pled guilty to marijuana trafficking in May 2013 and in 2018 violated the terms of his intervention treatment, leading to termination of the plan, with the story covered in the Salem News. Grandson James "Jim" Minerd made his home in 2018 in Columbiana. He is a sergeant in the U.S. Air Force Reserves and has worked at Origami Owl. Grandson John Minerd wedded Amanda (?). In 2018, their residence was in East Palestine. Granddaughter Patricia M. "Patty" Minerd (1967-living) was born on Nov. 12, 1967. She and Vincent A. Lambright have produced a child. She lived in Columbiana in 2018. Stepson Brian E. Berry (1962-2018) was born on Feb. 6, 1962 in Salem. In about 1994, he wedded Sandra Harper ( ? -living). Their marriage lasted for 24 years until the separation of death. Their offspring were Brandon Lindsay, Eric Berry, Amanda Noel and Taylor Berry. The family dwelled in East Palestine, where Brian was a self-employed carpenter. He also loved to hunt, fish, ride motocross and dirt drags, and helped to construct a playground and related equipment in East Palestine Park. Heartbreak enveloped the family at the death of Brian's half-brother Michael Minerd and son-in-law Matthew Noel. Sadly, Brian died at the age of 56 on April 12, 2018 at St. Elizabeth Health Center in Boardman, Trumbull County, OH. A memorial service was held at Abundant Life Fellowship in New Waterford, OH. Stepdaughter Beth Berry resided in Columbiana in 2018. She may have been married to Christopher A. Lattanzio (1961-2010). Son Lawrence "Larry" Minerd (1914-1935) was born in about 1914 in Fayette County, PA. He was employed at the age of 18 as a truck driver for the Olympia-Oakford Amusement Park in McKeesport, PA, and resided near Pittsburgh. He often wrote letters home to his sister Irene. In one letter to Irene, circa 1932, he wrote: "Dear Battle ax: Boy wasn't that some picture we took of Geo & I. It was the cats aspirins. How is little billy and everybody else. Did we have a swell time here last week one nite. The Park closed early and all the stand girls and a couple of fellows & I went up on the Hotel Porch and started to sing all the old time cowboy songs we could think of and it really sounded nice. I ain't got burnt yet nor I ain't lost it all yet. One morning Bess gave me hell and I was made when I opened the stands and the girl in #2 raised a fuss about the way I stocked the pop in but I didn't say and when I went to #1 she started to pop of[f] and then I poped of[f] and told her where to head in at. If she didn't get a cussing mobody never did and them girls never followed sense about the pop cases but the girl that worksw in no. 4 is the best of them all. She won't let me swear or telly funny jokes or nothing in here and is she good looken and she walkes up through the Park every night in the dark with me after we close up. I'm never called by my right name here it's either Larry or Clarence." Another letter, dated 8:15 Wed Nite 1932, said that "seems like I been here a year already. Geo. is in Uniontown tonite to take some flowers up to the graves, Bess went with him. You know it rained like H--- over here today and I was hauling pop out of the cellar of the Hotel and it rained so hard I saw in the truck till it was over and my buddy was working in the cellar, so I didn't sit down more than 5 min till I was asleep. I slept for very near an hour till Sam woke me up and it was still raining hard. Tell Bill and them I think about them next Sunday when the Park opens with all them pretty gals. There is one girl that works on the rolly coaster selling tickets about the size of a small Box car. We have more fun with the fellow that runs the rolly coaster about her that he tell us to stay to hell away from there so as not to make her worse." Later, Lawrence moved back to Warren and obtained a job driving a truck for the Hess Modern Market. [He] drowned in Mosquito creek near the Youngstown road bridge.... Witnesses said Minerd swam across the creek shortly after 8 p.m. and was about half way back across the 25 yard stretch when he apparently was overtaken by cramps. He sank in midstream and his body was removed from the water an hour later by the Warren fire department. He had crossed to the east side of the stream and had shouted to companions just before he plunged into the water on the fatal trip. "Wait 'til I rest a minute and I'll come over," he told them. His body was brought back to Hopwood for burial beside his brother Arthur. View a photograph of Lawrence at rest in his casket, surrounded by bountiful floral displays. Daughter Clara May Minerd (1906-1951) was born on April 22, 1906 in Smithfield, Nicholson Township, Fayette County, PA. Dr. H.B. Guiher of Smithfield assisted in the birth. She married George A. Atkinson ( ? - ? ), a truck driver. They resided in Canton, Stark County, OH, where she "was a member of the First Christian Church in Canton and the Royal Neighbors of America," said a newspaper. Their address was 1250 Oxford Avenue NW. They had no children, but raised a niece Arlene and a nephew Robert in their home. Clara was afflicted at age 44 with a ruptured cartilage in her spine. She underwent surgery at Mercy Hospital in Canton. Immediately after surgery, one of her lungs collapsed, and she could no longer breathe. She died the same day, on April 9, 1951. A newspaper reported that her death was due to "an extended illness." Her remains were returned to Hopwood Cemetery near Uniontown for burial. Spring 1930, corner of Chestnut & High in Warren. Back, L-R: Clara & George Atkinson; J.W. & Lillie Minerd; Irene & William Rosenthal & son William. Front, L-R: (? ), John & Margaret Minerd & children Catherine & Roy; Lawrence Minerd, Ann & Lenore Rosenthal, Dorothy. Daughter Irene Minerd (1909-1994) was born on July 6, 1909 in Smithfield. When she was a teenager, in 1927, she moved to Warren, OH with her parents. On Christmas Eve 1927, when she was age 18, Irene was united in holy wedlock with 27-year-old William E. Rosenthal (1900-1972). William had been married before and brought two daughters to the marriage, Lenore Helm and Ann Garghill, both born in Pennsylvania. The couple produced a son of their own, William J. Rosenthal. Irene "was a 50-year member of the Royal Neighbors of America," said the Warren Tribune. Circa 1940, the family dwelled at 157 Chestnut SE in Warren, and William earned a living as a foreman for a steel company. William died on Oct. 23, 1972, at the age of 72. Dr. Robert H. Hibbard officiated at the funeral service, followed by interment in Crown Hill Burial Park in Vienna, OH. Irene outlived him by a dozen years. Suffering from heart failure, she passed away at age 85 in 1994. Step-daughter Lenore Marie Rosenthal (1921-1986) was born on March 2, 1921. In about 1976, when she was 55 years of age, she married Homer H. Helm (1926-2004), son of Homer Hathaway and Julie Christine (Bohn) Helm of Fort Bragg, CA. He had been married previously and brought two children to the marriage -- Darleen Keltner and Mel Helm. They resided in or near Sonoma County, CA, where Homer owned Homer Helm Logging for 58 years and also worked in earth moving. Lenore passed away on July 12, 1986 in Sonoma County. Burial was in Santa Rosa Memorial Park in Santa Rosa, CA. [Find-a-Grave] Homer outlived his wife by 18 years. He joined her in eternity on Sept. 6, 2004. An obituary was printed in the Ukiah Daily Journal. Step-daughter Ann Rosenthal (1925- ? ) was born in about 1925. She was wedded to (?) Carghill. She was deceased by 1994. Son William J. "Bill" Rosenthal (1930- ? ) was born in about 1930. He married Mary J. Butcher ( ? - ? ) and had two children, Mary R. Gregory and W. Curtis Rosenthal. Bill has visited with the founder of this website several times and contributed significantly to our understanding of this branch of the family. Daughter Elsie Minerd (1920-1999) was born on New Year's Day 1920 in Smithfield, Fayette County, PA. When she was age 20, unmarried, she lived at home with her parents and worked in the tin mill department of Republic Steel in Warren. She was united in matrimony with Bernard Gnat (1918-1998) on Feb. 5, 1942, when she was age 21 and he 23. He was born in York Run, Fayette County, and the son of John and Sophia (Fralas) Gnat. They had two children -- Dorothy "Dory" Yoder and Bernard James Gnat. The Gnat home was at 342 Homewood Avenue S.E. in Warren, Trumbull County. Said the Youngstown Vindicator, Bernard retired in 1985 as a welder at ITT Grinnell, where he had worked 23 years, and previously worked at Packard Electric Division of General Motors Corp. He was a member of the Plumbers and Pipe Fitters Local 225. During World War II, he served in the U.S. Army Air Corps as a first lieutenant, receiving the Air Medal with three Oak leaf clusters. In his spare time, he enjoyed fishing, golfing and photography. Elsie spent her married years as a homemaker and enjoyed tending her garden. Suffering from repiratory failure, Bernard died in Forum Health Trumbull Memorial Hospital at the age of 79 in November 1998. Elsie survived her husband only by a year. She joined him in eternity on Dec. 5, 1999, at the age of 79, while a patient at Cortland Care Center. Interment was at Crown Hill Burial Park Chapel. Daughter Dorothy "Dory" Gnat was born in (?). She married Patrick "Pat" Yoder. ( ? - ? ). Circa 1999, their home was in Fowler, OH. Son Bernard James Gnat (1948- ? ) was born in about 1948. He lived at 342 Homewood SE in Warren as a young man and was employed at I.T.T. Grinnell. At the age of 26, on June 1, 1974, he was wedded to 25-year-old student Nikki Lee Rogozan, daughter of Nick and Dorothy (Watson) Rogozan, a native of Miami, FL but at the time a resident of Warren.. The ceremony was held in Trumbull County, with Rev. Fr. Timothy Popovich officiating. The couple was granted a divorce in Trumbull County on Jan. 30, 1979. On Sept. 6, 1981, at age 33, and still employed at I.T.T. Grinnell, Bernard married again to 31-year-old clerk JoAnn Prokup ( ? - ? ), daughter of Daniel and Josephine (Sernulka) Prokup. Rev. William Olynyk led the nuptials. By that time, Bernard had moved to 150 North Colonial in Cortland, OH. They remained in Cortland as of 1999. Daughter Dorothy Minerd (1922- ? ) was born on Feb. 27, 1922 in Smithfield, Fayette County, PA.
At the age of 17, in 1940, she dwelled with her parents and worked as a retail grocery clerk in Warren, Trumbull County, OH. On Dec. 21, 1946, when she was 24 years of age, Elsie was wedded to 21-year-old Alex "Richard" Black Jr. ( ? - ? ). Rev. Harold Mohn officiated at the ceremony held in Warren. 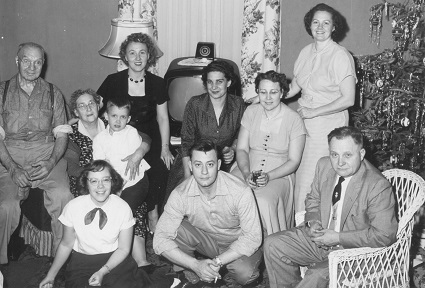 Richard was the son of Alex Richard and Margaret Mae (House) Black Sr. At the time of marriage, he worked at Packard Electric Company and lived at 539 Washington Street in Warren, and she was employed at the Trumbull Lamp plant of General Motors. Dorothy made her home in Vienna, OH in 1972 and in Warren circa 1994.